Another recipe using cooking apples. This received mixed reviews from those who tasted it: some found it sweet, others thought the apples gave it a nice tangy taste. If I make it again I probably won't use quite as many apples, but nevertheless I consider it a success and perfect for the Winter weather ahead. All measurements are rough guesses as it's a few weeks ago now that I made this. 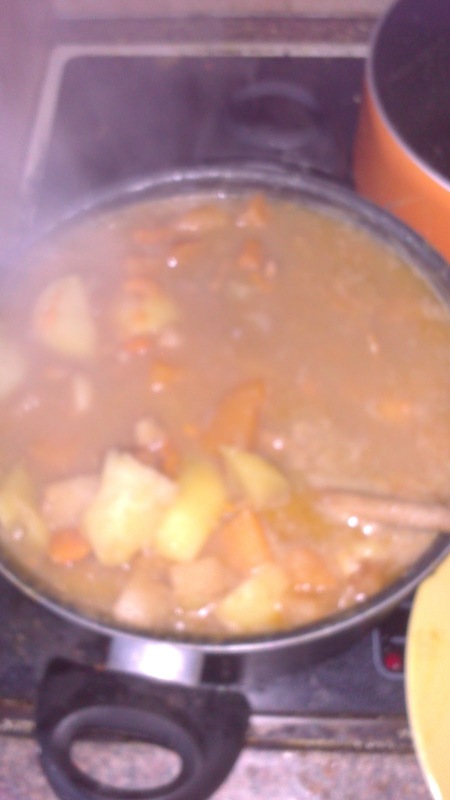 Here is the stew bubbling away when it was almost ready! Peel and chop the turnip, sweet potatoes, parsnips and 3 of the apples. Sweat them in a large pot with the pork chops (throw them in whole, the stew cooks for a long time and the meat will soften and come apart on its own anyway so no need to slice them) and a dash of olive oil (or what I used - Donegal rapeseed oil) until they start to soften. Add approx 1 litre of water and bring to the boil, then add approx 1 teaspoon of each of the spices and simmer for 3-4 hours. Peel and chop the potatoes and the other two apples and add to the stew, you'll provbably need to add some more water at this stage as well. Bring back to the boil then simmer for another hour or couple of hours, until the meat is falling apart and the potatoes are well cooked. Taste regularly during this period, you might need to add more spices.